A lob shot has a high trajectory. A lob shot is a high, soft shot that lands and stops very quickly. If you watch the PGA Tour, you see players hitting lob shots around the green when they have to stop the ball quickly. Many amateur golfers don't try this shot because of its difficulty. Learning to hit a good lob shot takes practice and proper technique. 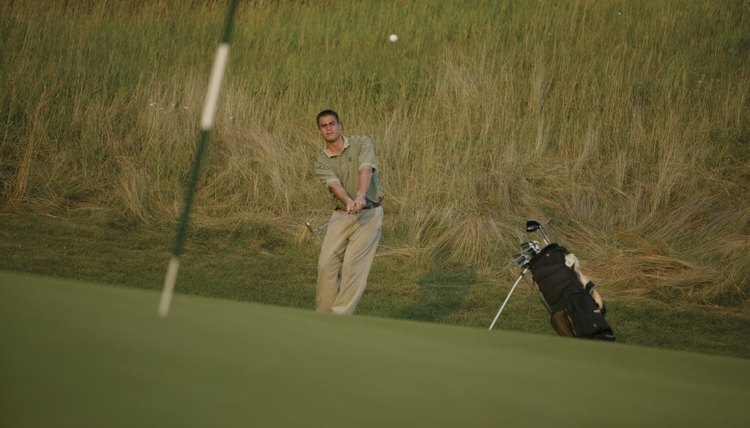 Once you learn how to hit a lob shot, you have a better chance to save par from difficult situations around the green. Grab your lob wedge or sand wedge. The lob wedge has more loft and will hit the ball higher than the sand wedge. Open the club face to add even more loft to the club. Your club face should be aimed slightly right of the target if it is open. Grip the club, keeping the club face open. Align your feet and shoulders slightly to the left of the target to make up for the open club face. Position the ball forward in your stance, off the inside of your front foot. Swing the club back slightly to the outside and hinge your wrists. Keep the club face open as you swing back. The further you swing back the longer and higher the shot will go. Swing the club down along the path of your feet. Keep the club face open as you swing down to impact. Let the club slide under the ball as you swing through impact. Turn your body toward the target as you follow through. Keep the club face open all the way to the finish of the swing.